Preheat the oven to 400 F. Grease and flour three 9-inch pans lined with parchment paper. Cream the butter and sugar in the bowl of a stand mixer on medium speed for 5 minutes, or until light and fluffy. Combine the cake flour, baking powder, and salt in a bowl and mix with a wire whisk. Combine the milk, flavorings, and Bailey’s Irish Cream in a large liquid measuring cup. With the mixer on low, alternately add the flour mixture and the milk mixture, beginning and ending with the flour mixture, beating until well blended. Beat the batter for 7 minutes on medium speed. Bake for 18 to 20 minutes. Test doneness by touching a cake top. If it springs back, it is done. If the indentation stays, it needs 2 to 3 minutes longer. 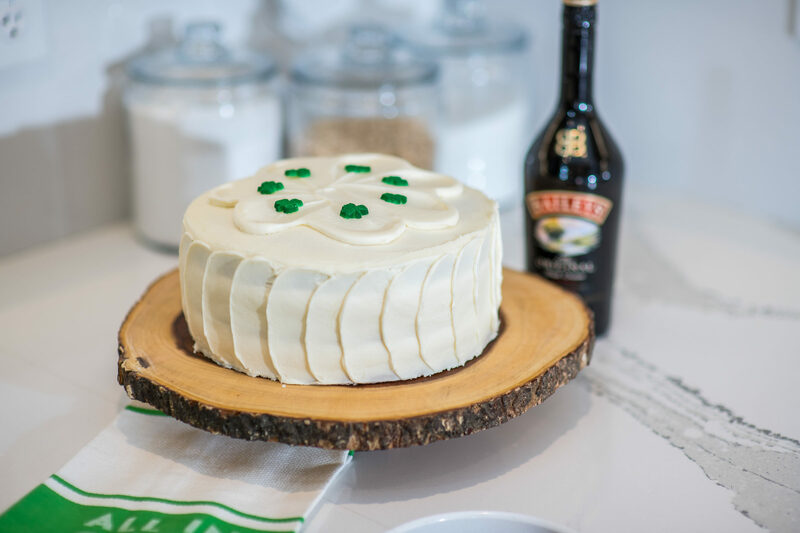 Add the vanilla extract and Baileys Irish Cream and beat for 1 to 2 minutes. After each addition of confectioners’ sugar, scrape the bottom and sides of the bowl extremely well. Once all the confectioners’ sugar is incorporated, beat on low for 3 minutes.